We’re now in the process of forming an online course in Jewish Meditation Instruction. If you are interested, please let us know! 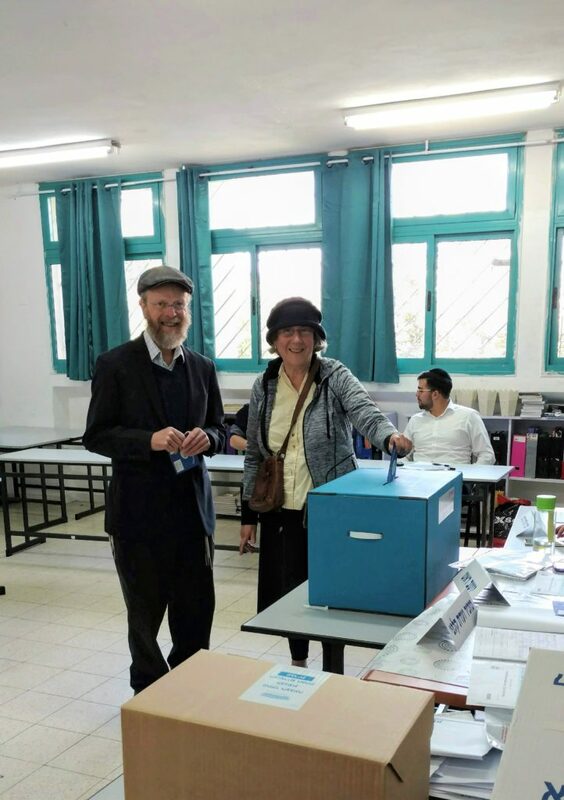 We voted in our first national election in Israel this week, and it was a moving experience. Yes, we used to do our civic duty in the States. But the freedom to vote in our own country, after two thousand years of exile and subjugation, is a special privilege. On Election day people are off work and it has a festive feel. At the polling station, for us a local school, voters are brought into the classroom with the ballots and ballot box two at a time, and a row of election officials and observers watch each person place their ballot in the box, so the line goes slowly. When our turn came, Anne turned to take a photo, and one of the election officials eagerly offered to take the picture for us. This slowed things down a bit as she fumbled with the smartphone, but everyone in the room and on line after us was patient enough – they understood the meaning of this moment. Political freedom is precious, especially when it protects and ensures social freedom, religious freedom, freedom of expression and freedom of ideas. But the principle of freedom itself is prior to its political forms, and this is what we celebrate in Pesach, which is called in tefillah זמן חרותינו — the season of our freedom. This freedom is expressed as a going-out – יציאת מצרים – going-out of Egypt. But the freedom of this going-out that we celebrate runs deeper than physical escape from oppression, important as that is. This week’s parashah features the purification ceremony for someone who has been healed of Tzara’at, the psycho-spiritual skin disease. Part of the ceremony involves trapping two birds and then releasing one to fly freely out to the fields. 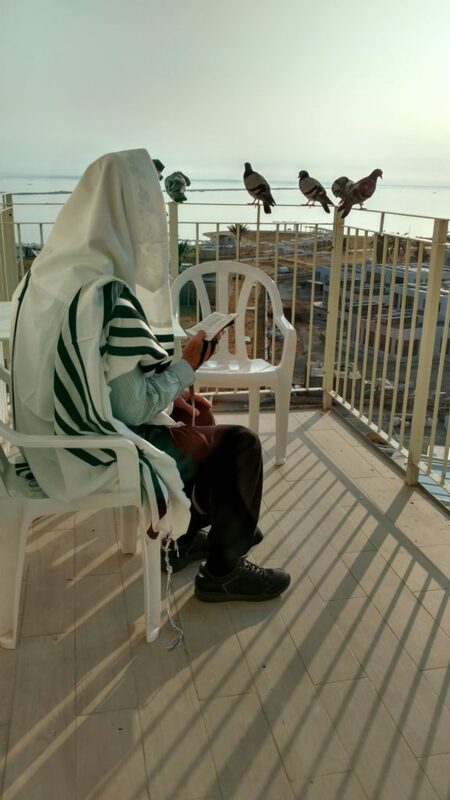 In the Gemara and halakhic commentaries the genus of birds used for this symbolic act is called ציפור דרור, literally a “free bird.” They’re free in the sense that they have no fear, and dwell just as comfortably around homes and towns as in the field (Shabbat Beitzah 24a and Rashi; Zohar 2:183a). In modern Hebrew the name is applied to sparrows. And the release of the little bird comes to symbolize the release of the person from the illness and from the patterns of behavior that contributed to the illness. Freedom of movement is based on freedom of mind. This is also one of the explanations for the greatness of Shabbat haGadol, the Great Shabbat before Pesach, commemorating HaShem’s command to begin preparations for the very first Pesach, the day on which Am Yisrael would leave Egypt. According to some midrashim and commentators, an aspect of the commemoration is the fact that the Israelites felt no fear in beginning their preparations for Pesach in Egypt by setting aside a lamb, sacred to the Egyptians, for their Pesach offering. They didn’t worry about what the Egyptians thought — and this was the beginning of their freedom from subjugation. This is also why there are two sections in the Haggadah expressing two different modes of freedom. First, following the opinion of Shmuel in the Gemara Pesachim 116a, is the section that begins “we were slaves to Paro in Egypt and God brought us forth from there with a strong hand and an outstretched arm,” dealing with release from physical, political enslavement. The second, following the opinion of Rav, is based on the passage from Yehoshua chapter 24, and begins “at first our forefathers were idol worshippers, and now God has brought us close to His service,” the spiritual freedom that begins in the mind. According to the kabbalistic tradition, we find this freedom within ourselves at the very core of consciousness — at the interface at which we receive our own live consciousness at every instant, fresh and refreshed from its divine source. The kabbalists instruct us to learn to access and cultivate this pure awareness through meditation, focused prayer and focused Torah learning. (Rabbenu Azriel of Gerona, Perush ha-Aggadot 16b-17a; Rabbi Menachem Recanati, Commentary on the Torah, Dt. 24:1). Rav Kook takes up this point in Orot haKodesh. He warns against what he calls the “spiritual idolatry” of those who hold stiffly to narrow, limited rules and think they know the nature and mind of God. Such people are chained by their own thinking. Instead, he points out the freedom at the very heart of existence: creation begins with HaShem’s free Will to create and manifests divine freedom and miraculous possibility through and through. Our mission as Am Yisrael is to serve God, which sounds like another form of slavery but actually means to attune our will and our consciousness to HaShem’s free Will, which already empowers us, and to recognize and facilitate what Rav Kook calls “supernal freedom,” the divine gift of freedom in ourselves and in the world. (Orot HaKodesh 3:21-36). In this, Rav Kook is echoing the Zohar, which says that the principle of freedom that Bnei Yisrael internalized and that brought them out of Egypt is the same principle of freedom that is the very essence of Torah (Zohar 2:46a). Someone who prefers to remain anonymous notes that the two great festival seasons of the Jewish year have what seem to be opposite themes. Pesach is about יציאה, going-out, while Rosh HaShanah through Sukkot is about תשובה, return. Yet they mirror each other. The return of the season of Teshuvah brings us out from the limitations and mistakes in which we had become trapped, while the going-out of Pesach, going out of limited and tracked patterns of thought, is a re-discovery of our authentic selves, the freedom at the core of consciousness. The run-up to the Israeli elections was pretty raucous, with politicians and parties jockeying for position and shifting allegiances, with accusations and indictments, with odd political ads and shameless pandering to constituencies. And even after the elections it’s still quite a circus as the coalition building takes shape. But it is a free and democratic process, the only free elections in the Middle East and a model for the world. And it was an honor to be a part of it – the ongoing legacy of Pesach, the divine gift of freedom.